CeRegEditor is a registry editor for Windows Mobile including WM5 and WM6, Windows CE, and Pocket PC 2003 mobile devices. CeRegEditor is probably a good alternative to PHM Registry Editor, although unlike PHM Registry Editor, CeRegEditor is a desktop based registry editor which remotely connect to the mobile device to manage its registry. That said, CeRegEditor runs on desktop PC to operates on a mobile device. Thus user can take advantage of the normal keyboard, mouse and big LCD computer monitor to manipulate, change, edit, create or delete the Windows Mobile Pocket PC registry, instead of been restricted to just stylus tap. Navigate and edit (or create) registry keys/values. Export or import keys in REG format. Management of favourites keys in registry. 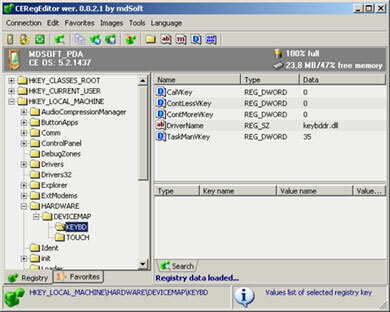 “Image” of registry with compare and restore service. Offline mode – create, edit files as regular device registry. Support for HV files edition. Has Unlock Registry embedded tool as a workaround to unlock and disable the blockage on writing to registry which causing Access Denied error when trying to edit keys or values in registry. CeRegEditor can be downloaded from ceregeditor.mdsoft.pl.